Dr. Thomas Noguchi has served the American Academy of Forensic Sciences and the forensic science community faithfully for more than 50 years. Born in Fukuoka-City, Japan in 1927, Dr. Noguchi graduated from Tokyo’s Nippon Medical School in 1951. The son of a doctor, he immigrated to the United States in 1952 where he interned at Orange County General Hospital. A series of residencies at Loma Linda University School of Medicine and Barlow Sanatorium in Los Angeles led to an appointment as a deputy coroner for Los Angeles County in 1961. In 1967, he became the county’s chief medical examiner. It was in this role that Dr. Noguchi came to public attention for a series of autopsies and investigations he either performed or supervised, including the deaths of Marilyn Monroe, Robert F. Kennedy, Sharon Tate, Janis Joplin, William Holden, Natalie Wood, John Belushi, and many more. Dr. Noguchi’s 15 years as the chief medical examiner for Los Angeles County earned him the nickname of “Coroner to the Stars.” He stepped down as chief coroner in 1982 but continued to work with the county, finally retiring in 1999. He was honored that same year by the Emperor of Japan who awarded him the Order of the Sacred Treasures for “outstanding contribution to Japan in the area of forensic science.” He was later appointed Chief of Pathology at the University of Southern California and then as Administrative Pathologist for Anatomic Pathology services at the USC Medical Center. Dr. Noguchi has been appointed Professor by both the University of Southern California and by UCLA. He is a Past President of the California State Coroners Association and the National Association of Medical Examiners (NAME). His service has continued as an Advisor to International Societies such as The International Journal of Legal Medicine, published by the Japanese Society of Legal Medicine, and The Journal of Medical Law. Dr. Noguchi’s recent honors include recipient of NAME’s most prestigious award, the Milton Helpern Medal in 2005; the AAFS Distinguished Fellow Award in 2007; the Los Angeles Society of Pathologists Lifetime Service Award in 2008; and NAME’s Lifetime Achievement Award in 2014. As an author and researcher, Dr. Noguchi has published more than 65 papers on a wide range of subjects in forensic pathology and toxicology as well as medical law. He has published in numerous peer review journals, and has authored several chapters in forensic books and many other publications. Over the course of his career, Dr. Noguchi has authored or co-authored a number of fiction and non-fiction books. Among these are Coroner, a best selling memoir written with Joseph DiMona, and Coroner at Large, both published in the 1980s; and Death Investigation, published in 1996 in Japanese. 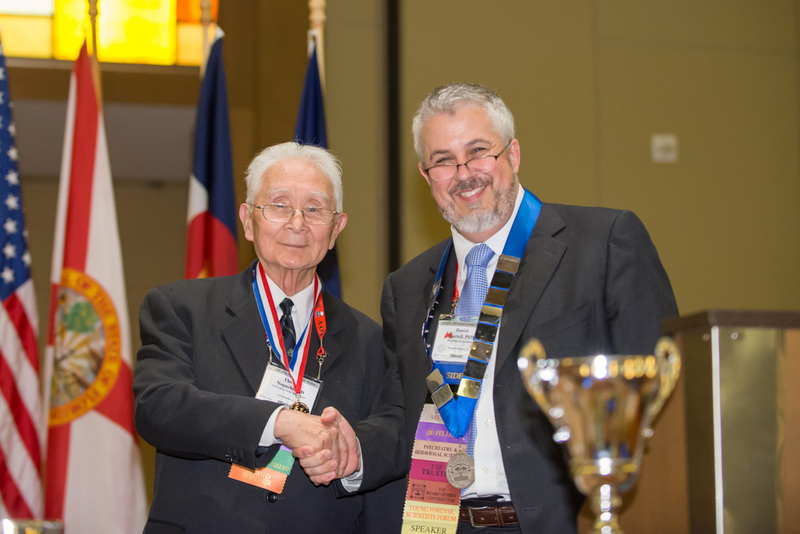 Dr. Noguchi was elected into the AAFS membership of the Pathology/Biology Section as a Provisional Member in 1962 and as a Fellow in 1965. He served as Section Secretary in 1966-67 and as Section Chair in 1967-68. Dr. Noguchi was appointed to serve as the AAFS International Liaison by the Board of Directors in 2000, and he has continued to serve on the International Affairs Committee to this day. Dr. Noguchi has introduced numerous international forensic science dignitaries to the Academy and has promoted the Academy’s reputation as the premiere forensic science organization throughout the world. Congratulations to Dr. Thomas Noguchi, the Academy’s 14th Gradwohl Laureate!